Merry Christmas from the team at One World Projects! With the help of our affiliate partner Charity Begins, we were able to hand-carry a donation of children's clothing and shoes to the Mae Tao Clinic, also known as Dr. Cynthia's, in Mae Sot, Thailand. (Mae Sot is a small Thai village on the Burmese border, and where the refugee women who weave our passport bags and scarves are also based.) The clinic provides free health care for refugees, migrant workers, and other individuals who cross the border from Burma to Thailand, and welcomes people of all ethnicities and religions. 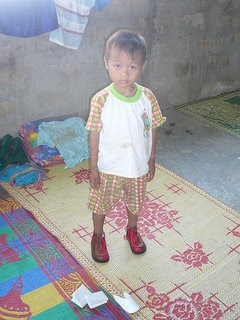 The picture below is of a boy (and his new shoes) who is staying at the clinic while his mother waits to deliver a new baby. It was hard to pick just one group to give our donation to, as there are many worthy NGOs that operate in this area. We finally settled on Dr. Cynthia's because of the amazing amount of good it's done for the Burmese people, and for its non-discriminatory policy of helping any one in need, regardless of ethnicity, class or religion. Please stay tuned for more reports of our work in this region and other parts of the world. Happy holidays and best wishes for 2008! Aid to Artisans has introduced us to more than a dozen different artisan organizations during on this trip. And while we haven’t had time to blog about each one, I did want to mention one particularly interesting organization called Turkman’s Women Actives Rights Association Afghnistan (TWARA). 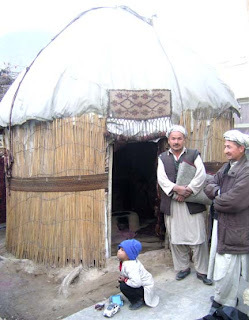 TWARA was established in 2005 with the idea of creating awareness among the Turkmen minority group living in the very remote areas of Afghanistan; mostly in the northern areas on the bank of the Amo River. TWARA identifies Turkmen communities in which there is a very low literacy rate and a lack of awareness about the routine of daily activities. They work with the women to educate them in health-care, parenting, and life-style issues as well as promoting their skills in handicrafts, finding markets, and improving quality. 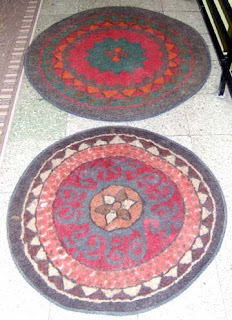 Their primary craft is handmade carpets; both woven and felt. The making of traditional Afghan carpets is very time-consuming but produces beautiful results, albeit with very hefty price tags. At TWARA, we found a unique alternative to the traditional Afghan carpet, one produced from felt, which is much more modestly priced. We have returned with a few of samples of quality felt rugs and we will see how our customers respond. The key to Afghanistan’s future is in the hands of its own people. The Afghan people are strong, proud, and capable; possessing determination and resilience. But they need to be given the opportunity by the world community. The same community that has for decades brought only war, despair and destruction, now needs to contribute in positive ways and not by imposing their wills on the Afghan people through violence. Yesterday I read an article on the BBC website(http://news.bbc.co.uk) that said a NATO spokesman apologized for the lives of innocent civilians lost because of mistakes made by NATO forces, and indicated that steps were being taken to reduce these mistakes. But in the same statement, the spokesman defended NATO’s record by saying that their forces had killed fewer people last year than the Taleban, who launched more than 100 suicide attacks. It is sad that we have become a world where human lives lost can be reduced to mere numbers and statistics and justified as either acceptable or unacceptable collateral damage. Afghanistan’s people need economic opportunity so they can provide for their families. They need meaningful work, education, and gender equality so they can regain self-esteem and a renewed sense of purpose. These things should be basic human rights afforded to all. Most Afghans live in abject poverty, earning less than $1 a day. The Afghan police receive $4 a day to put themselves in harms way, and the Taleban pay young men $400 to $500 per month to fight. Viable economic opportunities are needed to create any opportunity of peace, lasting change, or a better life. I leave this first trip to Afghanistan with two images that epitomize the worst and the best in this nation's struggle on the road to peace. For me, the most difficult image and the most vivid, was when our driver turned the corner onto a busy and dusty, two-lane dirt road. In the middle of the road, aligned in a single-line (to reduce the possibility of being run over) sat five women in burkas begging for money. Many of the women had disabilities and their burkas were covered with the dust and dirt thrown at them from the passing cars. I was told that begging in Kabul was a recently acquired phenomenon; that in the past women were too proud to engage in this activity. The image is a symbol of all the challenges that Afghanistan is struggling to overcome: poverty, oppression of women, casualty of war, and the loss of self-esteem and self-worth. 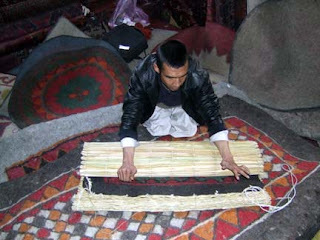 By contrast, perhaps our interpreter from Aid to Artisans epitomizes some of the best of Afghanistan. She is an intelligent and independent woman who was born in Afghanistan. When the Taleban came to power her family fled to Pakistan, and when the Taleban was overthrown, she returned to her homeland to live in the country that she so loves. She received a degree in computer engineering at the Kabul University, and has been accepted for a master’s degree program in Marketing at Bucknell University in Pennsylvania. She is passionate about learning and desires to find a way to use this knowledge to uplift Afghan women. And while oppression of women is still common, particularly in the provinces, we met many shining examples of women that have educated themselves, become doctors, teachers, and community leaders. From the point of view of artisans and artisans’ crafts there is much more diversity that we had expected. 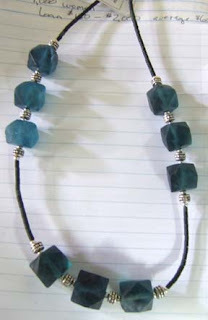 Most of the new lines that we will be acquiring are in high-quality jewelry made from gemstones like lapis, turquoise, fluorite, carnelian, amethysts, and quartz, embroidered textiles of handbags and clothing accessories, and felt rugs. We will also be working with NGOs like Turquoise Mountain to develop a line of ceramics and wooden carvings appropriate to the U.S. market. I want to extend a heart-felt Thank You to Aid to Artisans for their work with artisans in Kabul; to help them with design, to understand issues surrounding quality-control, and to learn what is necessary to become export-ready. For most of the artisans this will be their first experience of exporting to a foreign market and we feel privileged to be one of the first companies to work with Afghan artisans and further hope that through our relationships we can play a small role on the difficult road to peace. I also want to Thank DAI and USAID for generously sponsoring this trip; without their financial contribution it would not have been possible. It is the third suicide bombing in Kabul this week and you can feel the tension in the air. Even our driver admitted last night that he was somewhat anxious to be driving around Kabul. 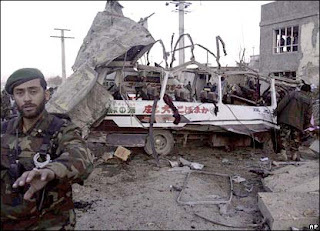 Yesterday, a suicide bomber drove up next to a bus carrying Afghan soldiers and blew itself up, killing 6 soldiers, 7 civilians, and injuring dozens of others. One of the civilians killed was the cousin of Aid To Artisan’s driver who just happened to be in the wrong spot at the wrong time. Violence of this type is on the rise in Kabul and local people are worried about the prospects for the future in this capitol city. We visited two NGOs working with women who have been afflicted by the war: Women for Women and The Children and Women Education Fund (CWEF). Women for Women in Afghanistan is part of a larger international NGO; Women for Women International. Their mission is to provide women survivors of war, civil strife and other conflicts with the tools and resources to move from crisis and poverty to stability and self-sufficiency. 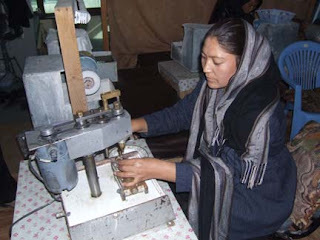 Women for Women in Kabul provides business skills, vocational, and life-style training to thousands of Afghan women. 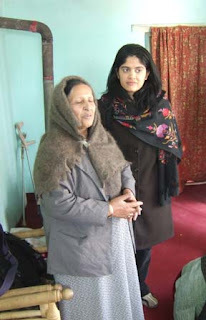 They also provide loans to more than 4,000 women use the funds to establish their own micro-enterprises. 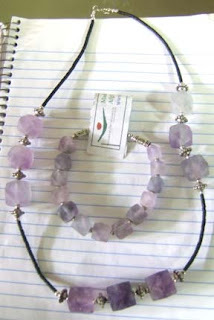 We asked the artisans to develop samples of several matching fluorite necklaces and bracelets in aqua marine, light blue, and purple. The second NGO that we visited was the Children and Women Education Fund (CWEF), a Kabul-based non-government organization that provides education, vocational training, and instruction on women and children’s rights to more than 320 women. 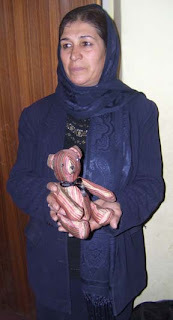 We are working with this organization to create an Afghan teddy bear program in which a teddy bear will be given to an Afghan child for each that is purchased in the U.S.. Charity USA and One World Projects each placed orders for 300 bears--with an aditional 300 bears purchased and left behind to be donated to children. 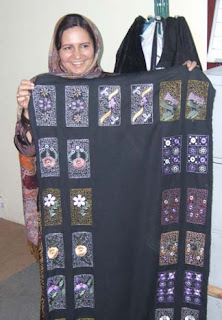 CWEF will also develop samples for an Afghan apron we hope to carry in the future. Winter is fast approaching in Kabul. When we arrived the mountains were bare, but now we awaken each morning to see a fresh blanket of snow rapidly making its way to the floor of the Kabul Valley. I’m told that the winter temperatures often drop to -20 F. With the high prices in gas and most Afghans living below the poverty line, it's a harsh existence. 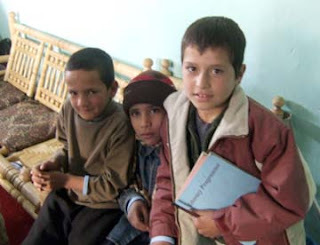 But while the weather may be cold, I find the Afghan people warm and friendly. The markets are bustling with activity and fresh produce of cauliflower, carrots, pomegranates, and apples fill the humble stands of vendors. Before we enter our hotel each night the car is searched for explosive devices by armed guards with automatic weapons. We pass through three sets of fortified-steel gates, and then we must have our bags searched and pass through metal detectors. We can’t even walk to the end of a block without being escorted by our driver. And while our movements are restricted, there isn’t an overwhelming fear of being kidnapped, assassinated, or blown-up. That being said, 22 people were injured today as another suicide bomber tried to blow-up a military convoy in Kabul on the road to the airport. Tim and I have taken on the traditional black and white scarf and wool hat (traditional dress of the Pinshar men who reside in the Mountains of Northern Afghanistan) in an effort to blend in with the locals. Now, unless you hear us speak you would hardly know that we were foreigners. 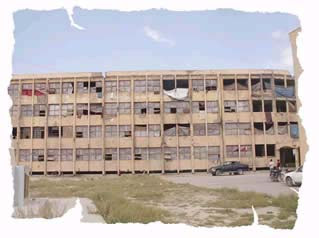 The dominant architecture in Kabul is Early 21st Century War; as the remains of buildings bombed by the campaign to oust the Taliban litter the landscape. The last few visits have been some of the most productive and encouraging. 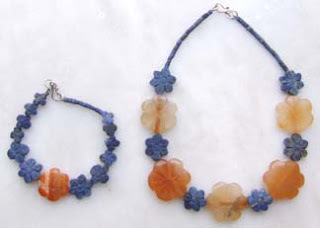 Today we spent most of the afternoon at Madina Handcrafts designing jewelry made from recycled glass, fluorite, lapis, carnelian, quarts, turquoise, and other precious stones. Medina’s mission is to empower vulnerable and disabled women through building their professional skills, providing literacy, health training and capacity building to help themselves and their families to reach self-sustainability. There are 21 women at the workshop in Kabul, many who are disabled, and another 200 in the provinces. 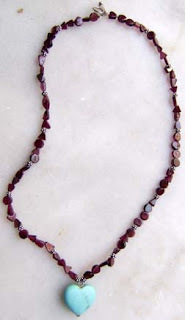 The women, cut, shape, sand, polish and assemble the stones into jewelry. 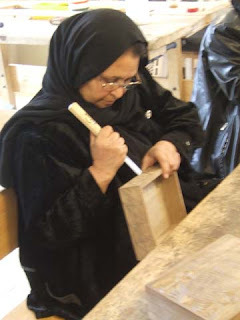 The workshop is hosted in the modest home of Shaima Shafaq who embodies the spirit and voice of Medina Handcrafts. Women come, many with children, and enjoy the solidarity and fellowship of one another while they work to provide for their families. Just a few of the many wonderful new pieces of jewelry that we will be adding to the One World Project line of Afghan products. I think this group is an excellent candidate for the Bridges to Peace Workshop 2008. I’m writing after our second day in Kabul. To my surprise, we have found much more depth and diversity in the hand crafts being produced by artisans in Afghanistan then we had imagined; cotton and wool textiles (both embroidered and woven), jewelry made of recycled glass and stone, ceramics and wooden carvings. 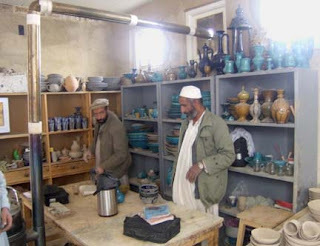 Most artisan crafts are made in the northern and western regions of the country, either in Afghan refugee camps inside Pakistan or outside of Kabul; little is available from the south and east near the border with Pakistan, a violent area still dominated by the insurgency and the Taliban. As I write this, I hear the morning call to prayer outside our window. It must be 5:00 am. Not surprising, there are so many stories to tell. Every group we visit, and each artisan we talk to, is another example of the strength of the human spirit to rise above adversity. This country and its people have been deeply wounded by war; it is evident in the way that people talk and you can see it in their eyes. Nobody has been left untouched. As we drive through Kabul, we see building after building destroyed by bombs, the overwhelming presence of Afghan military and police, and the occasional presence of U.N. forces. 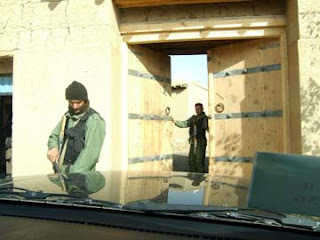 There is a feeling that security in Kabul has deteriorated over the past year, as the Taliban is beginning to resurge. One workshop organizer told us that while life under the Taliban was oppressive, there was less violence and fear of being blown-up by a suicide bomber or I.E.D. Now she can’t make the 1-day drive between Kabul and Jalabad without wondering if it will be her last. If you see an approaching convoy of tanks or other armored vehicles (usually U.S. military), you must quickly pull off the road and risk being blown up by an I.E.D. or fired upon by the military without any warning or provocation. Afghanistan and Iraq are now the mostly highly mined countries in the world. Women of Hope was started by an American woman, Betsy Beamon, who once worked for U.S. Air Lines. After Sept. 11, she felt compelled to move to Afghanistan to assist in the plight of Afghan women, and arrived without any training, experience or a plan. In just five years, she's been able to create a Vocational Center that teaches more than 70 Afghan women to create crafts, and craft a future. In response to these women expressing a desire to educate themselves and their family, Women of Hope opened a school in Afghanistan that's grown to teach 200 children (130 boys and 70 girls). There is also a refugee camp near Kabul called Ben-e-Wasak, a tent city in the middle of nowhere, that's home to more than 300 families. There are no stores or services, so the men have to commute 1-1/2 hours each day to Kabul looking for work. The Afghan government plans to move 42,000 refugee families into this area and to provide them with permanent land. When this happens, Women for Hope will distribute start-up kits to any resident who commits to start a business that will benefit the local community. Each kit will cost $500, and include the supplies a new store owner will need to set up shop. The goal is to fund a couple of grocery stores, as well as a propane shop, a bakery, tailor, textile shop, and a tool and building supply store. Ten percent, or $50, of the store owner’s earnings will be reinvested in setting up the next shop. This is how the community will grow and become sustainable. 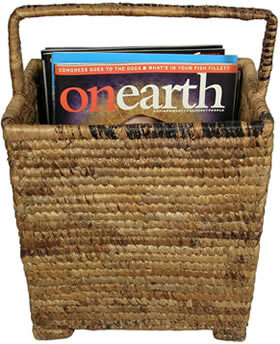 One World Projects will purchase one or more of these startup kits in the spring. The second group, Zardozi, works with more than 2,500 female artisans living in Afghanistan and the refugee camps in Pakistan. 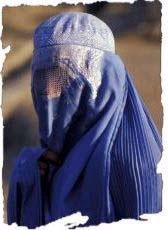 (There are an estimated 1.5 million widows in Afghanistan, 70,000 in Kabul alone.) Zardozi is the most established handicraft project in Afghanistan and has been helping Afghan artisans to find markets for their handicrafts for more than 20 years. Their products include high-quality embroidered bags and gift items. Today we are off to visit three more artisan groups: Turquoise Mountain, Nasima Silk, and Khaber Khosh Shop. Please stay tuned for the next report. Thank you for following and for your support. …..not on the past but on the future. As I begin this journey to Kabul, Afghanistan, I am aware that it isn’t without a certain element of risk. We want to expand the principles of Fair Trade to that of Compassionate Trade by addressing some of the most pressing global problems of our age: poverty, hunger, lack of education and health-care, environmental degradation, the rights of women and children and global violence. At One World Projects, we know that any worthwhile change does not come without sincere effort and sacrifice. As I write to you from Dubai, I also reflect that India, home of Ghandi and Buddha, two souls that I respect and admire and who did much to promote peaceful coexistence among all peoples, regardless of religion, race or status, is just a two hour flight across the Arabian Sea. Few fair trade importers work in Afghanistan, for obvious reasons. We have come here because its people have suffered so much by decades of war and violence, and need our help. 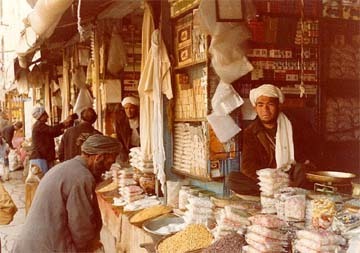 The average income of most Afghans is less than $1 a day. Men with few options available to them are often persuaded to fight in order to make a living, leaving the women to bear the financial burden of raising children alone. Now the country seeks a new path towards peace and prosperity, although the road ahead is still long and difficult. We can sit back and hope others chart a course that leads to sustainable peace, or we can help shape its positive new direction. 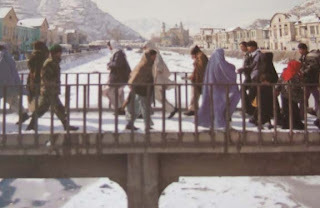 In addition to adding Afghani products add to our extensive line of fair-trade crafts, and building relationships with new artisans, we will spend the week looking for artisan groups to participate in our Bridges to Peace 2008 workshop. This workshop will bring artisans from conflict and post-conflict together with buyers from well-known companies in the U.S. to produce new products for the consumer market. The workshop will be hosted in the Ecuadorian Amazon and include artisan groups from Afghanistan, Burma and Colombia. We have hosted similar events twice before, but this will be the first time that the workshop has specifically focused on a theme of peace. In addition, we hope to produce a made-for-television documentary to chronicle the artisans and their crafts, and explore the principles of fair-trade and how economic opportunists can help build bridges to peace. I’ve just returned from 5 days in Bolivia, a country of amazing diversity, in both its landscape and people. The Andes and the Altiplano to the West give this country the highest average altitude in South America, while the tropical Amazon Rainforest hugs the country on the north and the east, above its central lowlands of rolling hills, forests, and savannah. 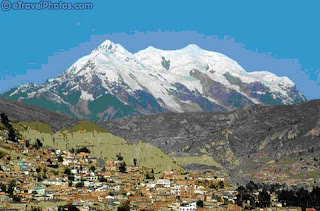 And Bolivia's people are comprised of three dozen Amerindian groups, including the Aymara, Quechua, Guarani, and Ayoreo, which creates the ideal setting for a wide selection of unique handicrafts. This is my 4th trip to Bolivia, and somehow it wouldn’t feel complete without the blockades that attempt to bring its transportation, business, government, and any semblance of normal life to a halt. (It is through these disruptions that the people express their disapproval of government policies.) This time, Bolivians were passively protesting government decisions that have led to an increase in the cost of goods and gas prices, combined with a skyrocketing cost of living that has forced millions of Bolivians to leave the country in search of better-paying jobs. 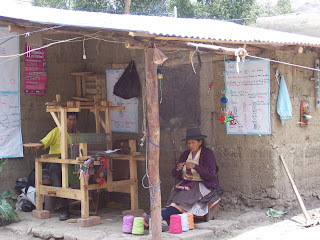 I spent the first few days in La Paz visiting with our artisans and exploring new groups. This year’s Andean Amazon Accent Show, which started one day late because road blockades prevented taxis, buses, and cars from getting to the fair grounds, led to a disappointing turn-out: approximately 200 exhibitors and just eight buyers. Despite this, we found a number of interesting new products, as well as new projects that will benefit inmates and disadvantaged children. 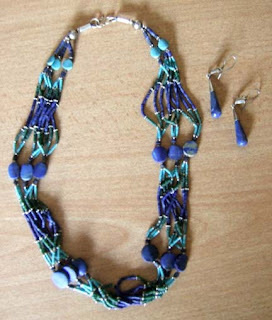 Keep an eye out for new items from Bolivia at One World Projects! We have a lot to be thankful for this year, and that includes you! Thanks so much for your support this holiday and all year long by helping us help disadvantaged artisans around the world. Here's a "good" game for you. A new U.N. campaign donates 10 grains of rice for each question you answer correctly at http://www.freerice.com. It's already generated enough rice to feed 50,000 people. We haven’t heard anything about the protests in Burma/Myanmar since late September, which probed us to do a little research. You’ll notice our new Campaign for Burma banner on the left. Please click there, for the latest news from this troubled region and to find out how you can help, or read on. Also, we’ve posted a YouTube video of the monks’ march and its brutal finale. It’s a long video (around 10 minutes) but worth the watch. Or, rather, check out our Kenyan Beaded Bowls & Boxes from the talented Samburu tribe in Northern Kenya. The article, called Women At Work, details one journalist's trip to four women's collectives, one of which is a visit to the Samburu at the Ol Malo Lodge in North Kenya. The article doesn't specifically mention One World Projects, but by showcasing our non-profit partner, we believe it's doing good by increasing awareness of a worthy project. One World Projects’ CEO and founder Phil Smith just returned from Chincha and Pisco, Peru, two of the cities hit hardest by the August 15 earthquake. He was there to assess the damage done to our artisans and workshops, and find the best ways to help the 100,000 people left homeless in the region. Phil reports that both cities look like a war zones, and the most notable landmarks in each are straw mats have been folded together to create faux huts. In Chincha, Smith booked the last hotel room in town, literally. “One-third of the buildings were standing, one-third were marked with a large X, meaning they were condemned, and one-third were destroyed.” All that is left of Pisco’s central cathedral is four walls amidst of a pile of rubble, a horrific reminder of the nearly 300 people who were buried while attending mass on that fateful Sunday evening. There are several relief organizations working on the ground, such as Mercy Corps, Oxfam America and CARE. One World Projects has chosen to work with a local group called Manos Amigas (hands joined in friendship), a nonprofit organization that works with individual workshops, groups and associations in Lima and in the Andean highlands to provide training in accounting, business administration, costing, and design, as well as the packaging and shipping of the products. 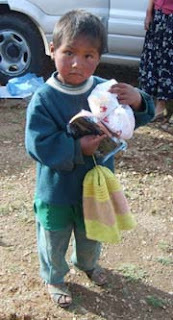 Our donation will help earthquake victims in Huancavelica, one of the poorest villages in Peru, and one that sits a bit further from the coast, and the center of the relief efforts. Says Smith, “It will be a long time before these people are able to rebuild, and they can’t afford to do it alone.” You can help, either by making a direct donation to one of the organizations listed below, or by shopping for Peruvian products at One World Projects. This region is known for anything and everything felt and embroidered - from hats to clothes to change purses. We don't know if we'll carry product from this region or not, but we wanted to inform you of Liz's trip, as One World Projects and its partners often travel in search of new artisan groups who share our vision: to help artisans in some of the world's poorest countries improve their lives and communities through fair trade, and in an environmentally- and socially-responsible manner. Check out Liz's blog for a full report! Issue seventeen of Planet magazine features a lovely photo article of the Samburu tribe from Kenya. This is the same tribe that creates our Kenyan beaded bowls and boxes. The sales from these products are reinvested back into community to help fund medical clinics, schools and art centers for one of our planet's last indigenous tribes. Instead of spending his mornings surfing the net on his Microsoft-enabled laptop, while sipping a latte hand-delivered from Seattle’s Best, billionaire Bill Gates is giving hundreds of millions of dollars to malaria vaccine and treatment programs, according to an article published in the BBC on Wednesday. Speaking in Seattle to a meeting of 300 scientists and policymakers, Gates called on global leaders to embrace “an audacious goal - to reach a day when no human being has malaria, and no mosquito on earth is carrying it." "We will not stop working until malaria is eradicated." Maybe Microsoft isn’t all bad. The article also showed positive first results of an anti-malaria vaccination in a small group involving 214 infants in Mozambique. Although it’s still early, the treatment appeared to a success: after three months infants who'd received it were 65% less likely to contract malaria than a control group. 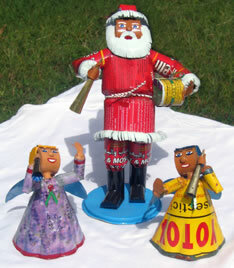 Another way you can help is by supporting artisans in Mali who are producing tin angels and santas from used mosquito pesticide cans to spread the word about this 100% preventable disease. 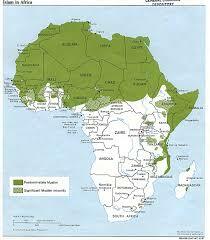 With one malaria-related death every 30 seconds in Africa, we don’t have half-a-minute to lose. Can Gender Equality Put an End to Poverty? Today is UN World Poverty Day, and although it's not really one of those happy holidays, it's is still a positive event, if you really think about it. Awareness is often the first step in making a difference. Take Gore, for example. Years ago he was mocked when he first brought up the topic of global warming. But he kept pressing the issue, and pushing buttons. Finally people started to listen, movies were made, books were written, and he even won a Nobel Peace prize. Turns out he was just ahead of his time. But back to World Poverty Day. In 2000, as part of the Millenium Development Goals (MDGs), world leaders pledged to cut poverty by half by 2015. Yet we're already in 2007, halfway to the deadline, and it's clear many countries aren't going to make the cut — unless there is radical change. We think our sister company EDImports has the right idea. By focusing on women as economic drivers, founder Liz Wald has seen children educated, homes built, medicines purchased, and behind it all, self-esteem nourished as women step up to provide for their family and local economy. The Economist called women “the most powerful engine” of global economic growth, and estimates that within the past decade, women have contributed more to global economy than the entire country of China. For more information, browse through this list of facts and figures to really see how gender equality can lead to economic growth. Who said women should stay at home? Wasn't us. Today is National Blog Day, and we figured it's a good time for us to join Technorati. As you know, One World Projects is new to the blogosphere, but we've 'jumped on the bandwagon' to show you how your fair trade purchases are really making a difference to artisans from some of the world's poorest countries. Each time we go on a buying trip to meet our artisans or hear someone tell us a story about how fair trade has helped their town finance a school, we are reminded why we work here. So we've started this blog so you can also see fair trade in action. It's real, and its makes a real difference. We're halfway through National Fair Trade month, we hope you'll continue to consider fair trade even after the next two weeks have passed. We love our jobs and seeing fair trade first-hand, and know you will to! Please tell your friends and family about us. Thanks for your support! Former Vice President Al Gore and the U.N. climate panel were awarded the Nobel Peace Prize today for their role in bringing global warming into the international spotlight. According to an article on the front page of The New York Times, Gore and the United Nations' Intergovernmental Panel on Climate Change (IPCC) won "for their efforts to build up and disseminate greater knowledge about man-made climate change, and to lay the foundations for the measures that are needed to counteract such change", said the Norwegian Nobel Committee. Their prize for saving our planet? $1.5 million greenbacks. Gore says he will donate his half to the Alliance for Climate Protection, a bipartisan nonprofit organization that is devoted to changing public opinion worldwide about the urgency of solving the climate crisis. As Gore said Friday, “global warming is the most dangerous challenge facing humanity and it's time to step up awareness of the threat. It truly is a planetary emergency and we have to respond." You can help spread the word by donning earth-friendly goods, such as jewelry made from tagua nut, a renewable rainforest product that feels like ivory but is really animal-friendly, or a magazine rack that's been handmade from banana bark in Northern Rwanda's Virunga mountains, the same place Liz got cozy with this endangered mountain gorilla and her baby. This trip got off to an exciting start as the cockpit of our plane shattered during taking-off from Miami International Airport. After circling for an hour it was decided not to dump fuel but rather to make an abnormally high-speed landing; necessary because of the extra weight caused by the fuel-laden plane. We landed without incident and were welcomed by an entourage of 9 emergency vehicles that chased us down the runway. After changing aircraft we arrived in Lima early Thursday morning (October 4th) after a delay of 6 hours. The first two days have been focused on the 9th Annual Peruvian Gift Show, and reconnecting with our existing artisan groups and searching for new partners that share our commitment to high-quality artisan crafts and social and environmental-responsibility. 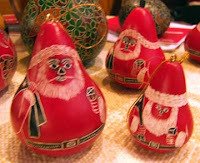 This year, Peru is all about the gourds, and we've picked up some new designs - Red Santas, Snowmen and Penguins, and many others (not shown in this blog) - to complete our unique collection. For more information on the gourd-making process, or to peruse our complete line of boxes, birdhouses, baskets, gourd cats and dogs, and musical instruments, all handcarved in Peru, please visit One World Projects. Materials will be in our warehouse by the end of October or early November. My next note will introduce two new suppliers; one making baskets from toquilla fiber and the other producing handmade-paper crafts from recycled-paper and plants. We appreciate your support, and thanks for reading! Attention, Seattlites! Got $50 bucks? Perfect. That’s your ticket to this Saturday’s runway show on Pier 66, which will feature specialty pieces from Diane von Furstenberg, Heatherette and Oscar de la Renta. (Admission into the after-party is also included). Proceeds from Green Fashion Week will benefit Earth Pledge, a nonprofit organization dedicated to green initiatives. If you don’t live in Seattle, don’t despair. One World Projects has a huge selection of eco-chic designs to sate your inner eco-fashionista, such as handwoven shawls that support Burmese women living in refugee on the Thai-Burma border, or funky bracelets from a fair trade artisan workshop in Colombia established to provide much needed jobs to Colombian youth. Check us out at One World Projects. And just in case you haven’t heard, today is World Animal Day. Whether you choose to celebrate your favorite pooch or feline, or support animal-friendly practices in the Amazon (or both! 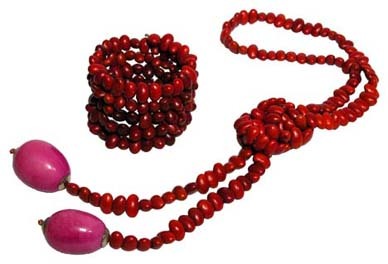 ), our assortment of Tagua Nut products could be right up your alley. Remind husband to take out trash. Get coffee for the boss. Rally against neo-liberal trade policies that will harm people, animals and the environment in Peru. Bill Moyer’s Journal will be covering the Free Trade protests this Monday, October 1 at 9:00 AM outside the Upper West Side office of New York Congressman Charles Rangel, Congress' strongest and most influential supporter of the Peru Free Trade Agreement. The proposed Free Trade agreement will destroy Amazon rainforests; expand inhumane, polluting factory farm agriculture; limit access to AIDS drugs; displace family farmers, leading to increased cocaine production and forced migration; undermine labor organizing; and set the precedent for pending trade deals with Panama, Colombia, and South Korea. Ironically, today also kicks off National Fair Trade Month. A Congressional vote is planned for early October, so we must voice our opinions NOW. Charlie Rangel's Office is located at the Adam Clayton Powell State Office Building, 163 West 125th Street at 7th Avenue (A ,C, B or D trains to 125 and walk 2 blocks east) Additional info: (347) 905-7334 or info@tradejustice.net. Today's reports of violence, during which 100 monks and laymen were arrested after a brutal military clash in Yangon, Myanmar (formerly Rangoon, Burma), remind us that a lot of good needs to happen in our world. 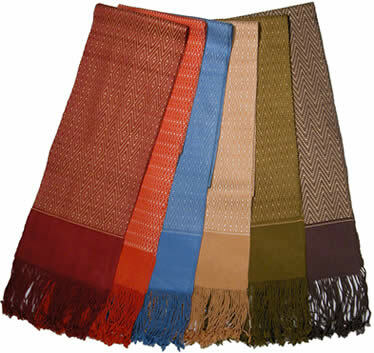 You can help the Burmese artisans who have been forced to flee their country's brutal dictatorship for crowded refugee camps in Thailand by shopping for Burmese scarves, ornaments, cards and dolls online at One World Projects. Speaking of good, we'll be attending GOOD magazine's one year anniversary party this Saturday at the Smithsonian's Museum of the American Indian. For those of you who aren't familiar, GOOD is "media for people who give a damn" and according the magazine's founder Ben Goldhirsh, "GOOD exists to add value... [and] provide[s] a platform for the ideas, people, and businesses that are driving change in the world." Check out the magazine’s blog for a behind-the-scenes scoop of this week’s violence from a Burmese staff member. Thai policy discourages income generation by refugees within the camps, and forbids people to work outside the camp. So One World Projects has partnered with WEAVE (Womens' Education for Advancement and Empowerment), a non-profit organization working within Thailand, to assist refugees in providing for their families by expanding the market for their crafts into other parts of the world. Shopping for finely woven Burmese items gives back to the artisan and her family by paying a living wage for her work, enabling her to feed her family and educate her kids, and makes an excellent holiday gift. Now that’s GOOD. As Fair Trade Month approaches, we'd like to share a podcast from one of our favorite media outlets: UTNE magazine. In this episode, host Leif Utne discusses the future of the Fair Trade movement with a representative from TransfairUSA and two fair trade companies that are pushing the movement in new directions — Oké USA, which imports Fair Trade fruit, and Fair Trade Sports, which imports soccer, volleyball, rugby and other sports balls. Plus, how green is your city? Leif interviews Warren Karlenzig, chief strategy officer at SustainLane and lead author of the recent book How Green Is Your City? for his list of the top 10 greenest cities in The United States. The answers may surprise you. One World Projects and ED Imports. Socially-consious shopper? We'd like you to meet SustainLane, the Amazon.com for the environmentally-minded. Check out this video of SustainLane's booth at last year's Green Festival event in San Francisco for a quick run-down on the company and its mission. Don't forget, One World Projects will be at The Green Festival at the Washington D.C. Convention Center this October 6-7. We would love to see you there! 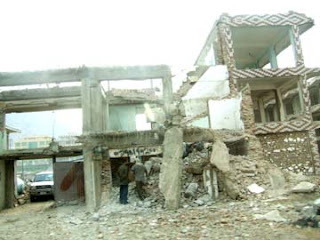 This October, One World Project's CEO Phil Smith will be traveling to Peru to assess the damage done by the August 15 quake that killed at least 437 people and injured 1,350 more, according to Peru's Health Industry and The New York Times. An earthquake of this magnitude, measuring between 7.7 and 7.9 on the Richter scale, has not been seen for 35 years in Peru. The coastal communities of Chincha, Pisco, Ica, and Canete were hit the hardest, leaving thousands of people homeless; like Leonidas Orellana, shown above in her destroyed pottery workshop, many have lost everything. One World Projects and The Nantucket Tennis & Swim Club are donating more than $2,000 to artisans to help rebuild their workshops and lives. We will post our travel entries and photos here and keep you informed on what you can do to help earthquake survivors. Fair Trade is now on Google Earth! Now you navigate the globe to discover Fair Trade Certified farms in Latin America, Africa, and Asia! Once you have registered, you'll be eligible to accompany Phil in cyberspace (via Google Earth's "fly to" tool) on his upcoming trip to Peru. Plus, read on for 12 tips to promote Fair Trade in your community, courtesy of our friends at TransFair USA. Don't forget, Fair Trade month is just over a week away! Flash floods have led the UN to issue a warning over the weekend as the heaviest rains in recent history affect over 1 million people in Sub-Sahara Africa, and counting. By submerging the region's most productive farmland under water, the recent flooding provides no relief for what is already one of the world's poorest regions. According to Saturday's BBC News, the United Nations reports an urgent need for food, shelter and medicine, and warns of outbreaks of water-born diseases, such as of cholera and dysentery, as well as locust infestations that could affect the residents of 12 countries if flooding continues. Uganda has been hit the hardest, with up to 400,000 people affected in the country's heaviest rains in 35 years. Nine people are reported to have died and food security if one of the countries biggest concerns. Deaths have also been reported in Ethiopia , Rwanda, Ghana and Sudan, and have led to a barrage of emergency disaster relief programs aimed at providing shelter and food to those displaced by this crisis. Please do what you can to help by donating to your favorite charity or disaster relief program, or support artisans in the affected regions by shopping at Economic Development Imports, our partner company and a fair trade distributor of East and West African products. Map courtesy of BBC News.